Yeah! More Subtle Cemetery Hill Construction! 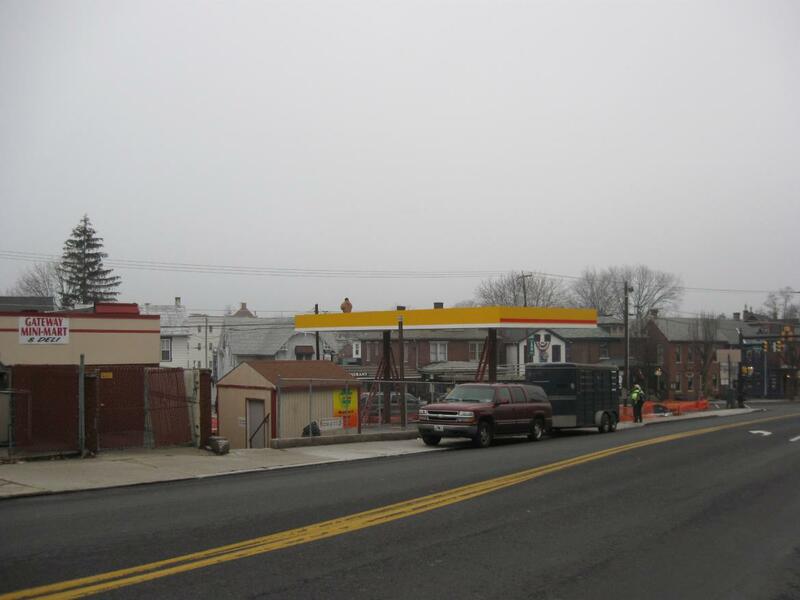 Near the foot of historic Cemetery Hill, another non-historic structure is being erected. 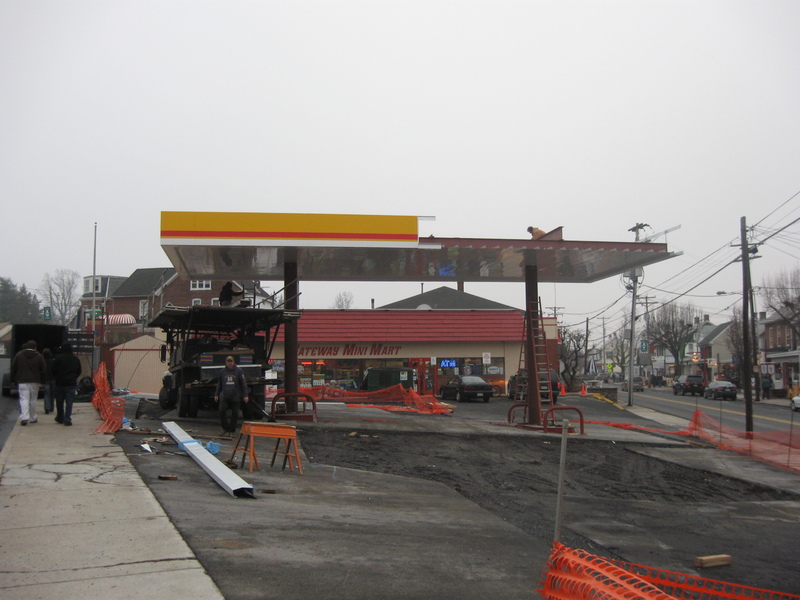 At the Gateway Mini Mart, an overhang for the new gas pumps is being put into place. We are not only ecstatic that it is being built, we are thrilled that it will be so colorful. This view was taken facing northeast at approximately 4:00 PM on Saturday, December 27, 2008. 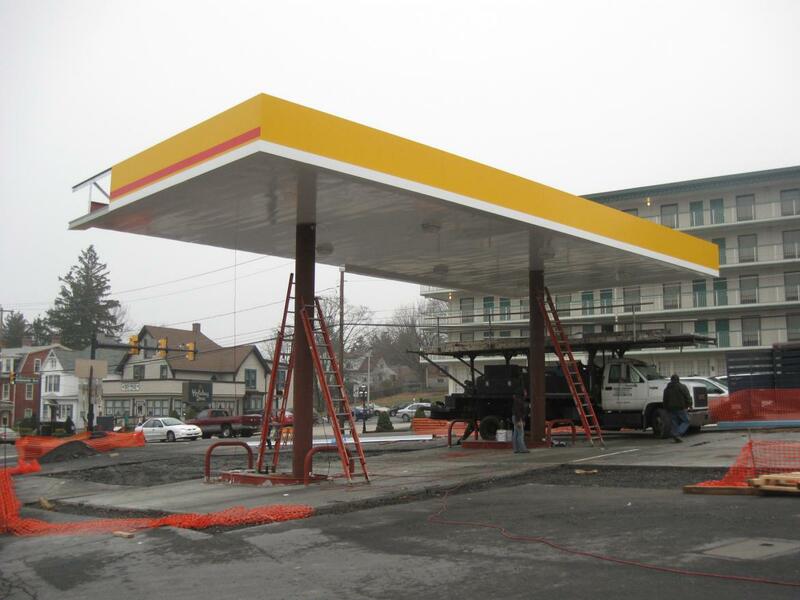 A couple of years ago, the Sheetz Convenience Store at the intersection of Steinwehr Avenue and Baltimore Street closed its store and its gas pumps and moved to a larger location east of town. 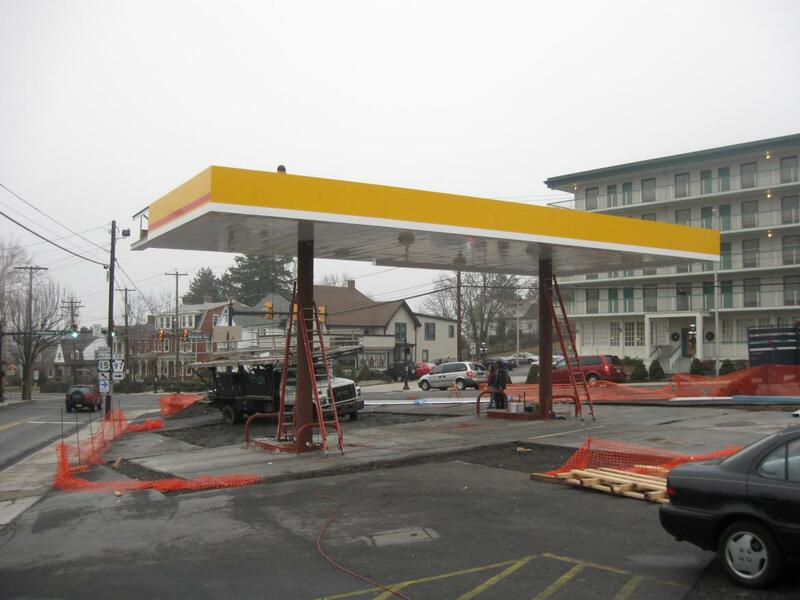 The Gateway Mini Mart took the same location without selling gas, and without the unsightly overhang which covered the gas pump area. 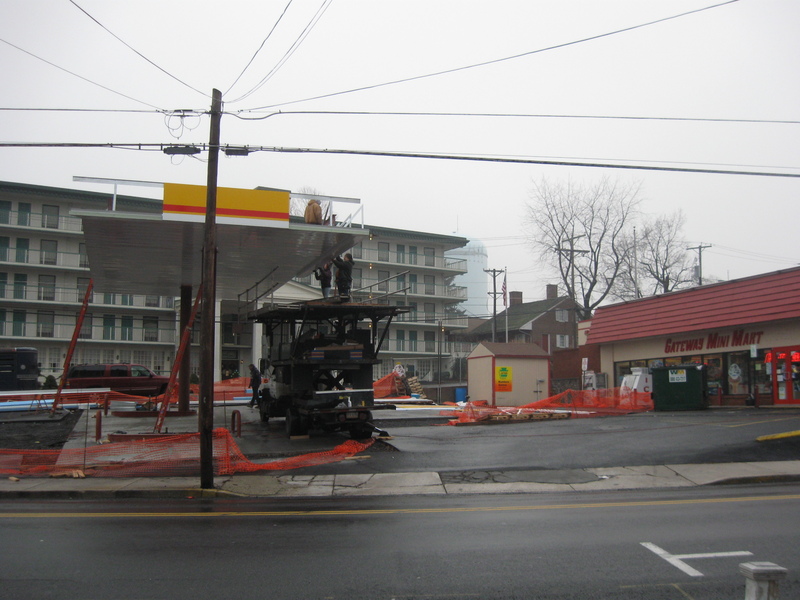 Now, however, the Gateway Mini Mart is going to sell gasoline, and another overhang is returning. The Gateway Mini Mart was the location of the Wagon Hotel in the 1860s. 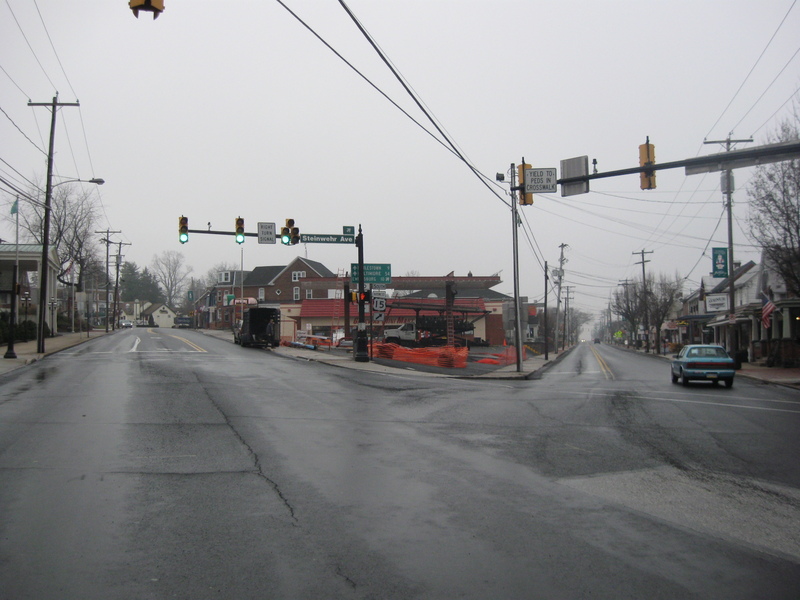 Baltimore Street is on the left, and the Emmitsburg Road (Steinwehr Avenue) is on the right. 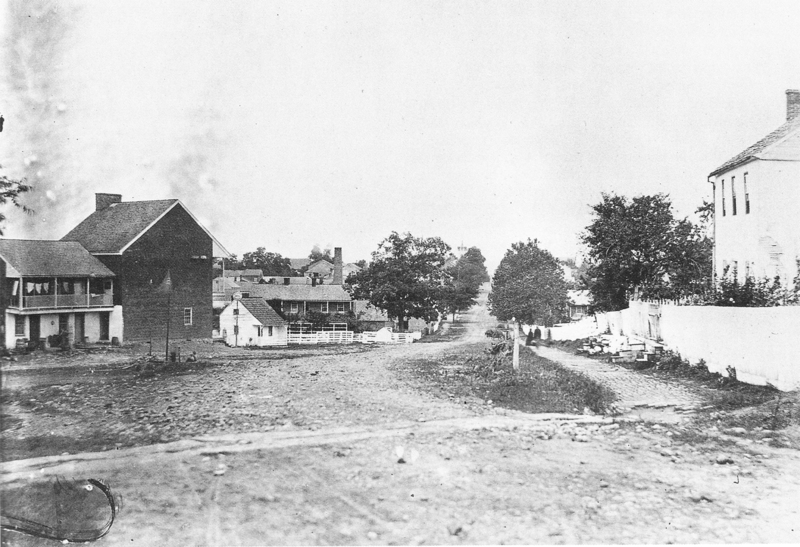 This view was taken at facing south in 1884. Cemetery Hill begins a couple of hundred yards behind (north of) the position where the photographer is standing. The pretty yellow facing on the overhang has not yet been put in place. This view was taken facing south at approximately 9:30 AM on Saturday, December 27, 2008. 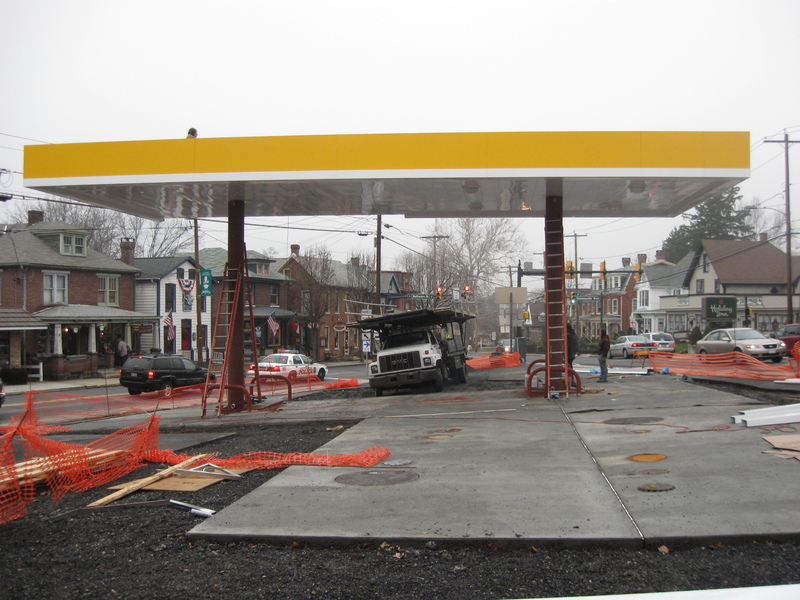 The area without the asphalt is where they have recently buried the new gas tanks. 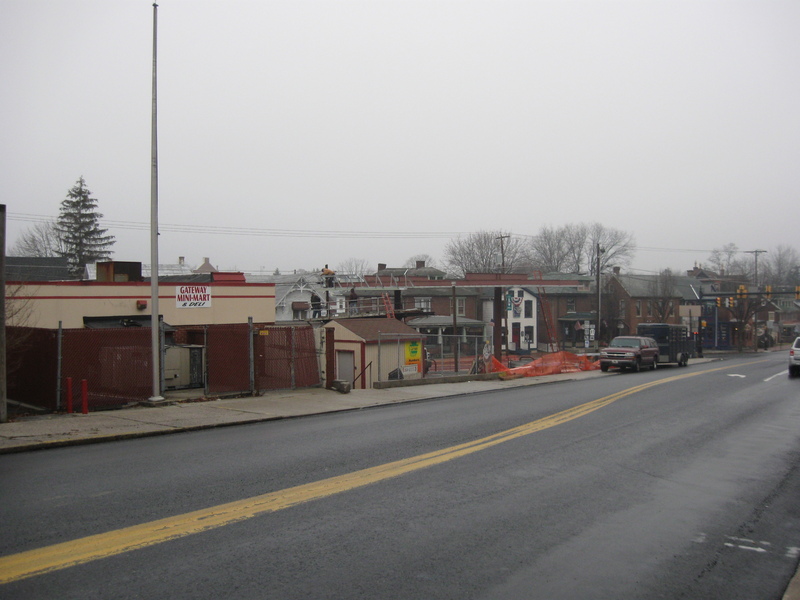 This view was taken facing south at approximately 4:00 PM on Saturday, December 27, 2008. But we should keep developing this area. The Holiday Inn is in the background. The roof of the Jennie Wade House is just visible to the right of the Holiday Inn. The light green/light blue water tank that is a good landmark to Cemetery Hill is barely seen through the fog above the Jennie Wade House. This view was taken facing west at approximately 4:00 PM on Saturday, December 27, 2008. Here’s a better picture of the Jennie Wade House. It is squeezed in between the Holiday Inn on the left, and the Gateway Mini Mart on the right. It’s wonderful that people who visit the Jennie Wade House have a place to stay right next door, and if they get hungry, or need gas, now they won’t have to go too far. This view was taken facing southeast at approximately 9:30 AM on Saturday, December 27, 2008. Some of our readers will think, “Hey, this area’s been developed for years. What’s the big deal?” That’s right, let’s just go ahead and make sure historical restoration never returns here. It’s not like this area was important in July, 1863. This view was taken facing northeast at approximately 4:00 PM on Saturday, December 27, 2008. 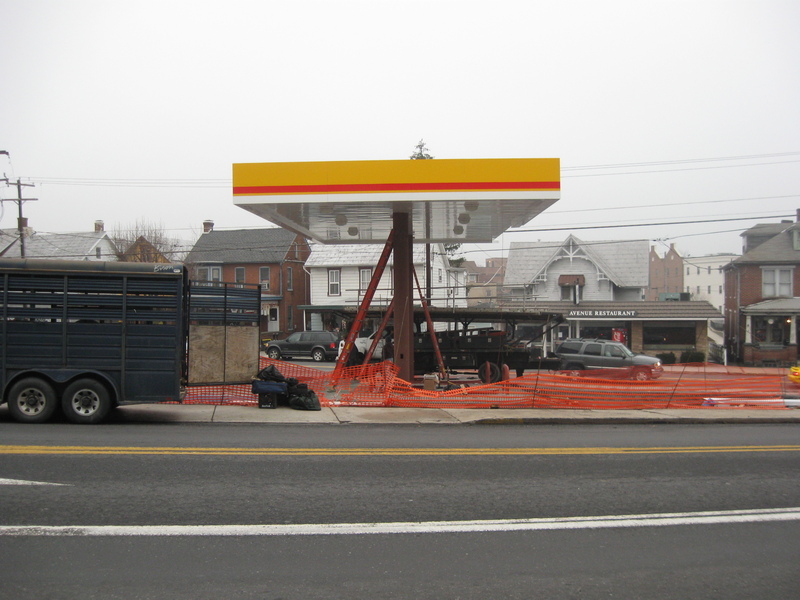 Gateway pushed to have the gas pumps restored when gas was approaching $4.00 a gallon. 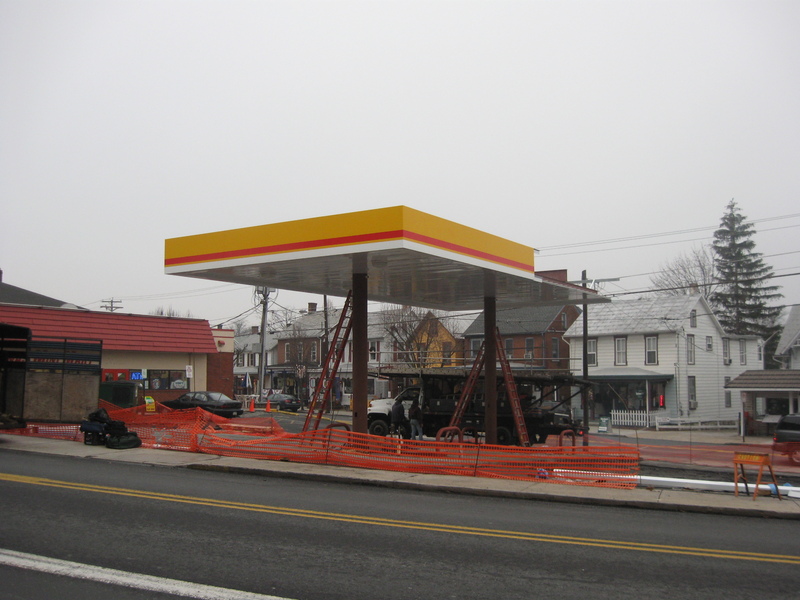 We must not have had enough gas stations in the Gettysburg area to handle the demand. This view was taken facing north at approximately 4:00 PM on Saturday, December 27, 2008. 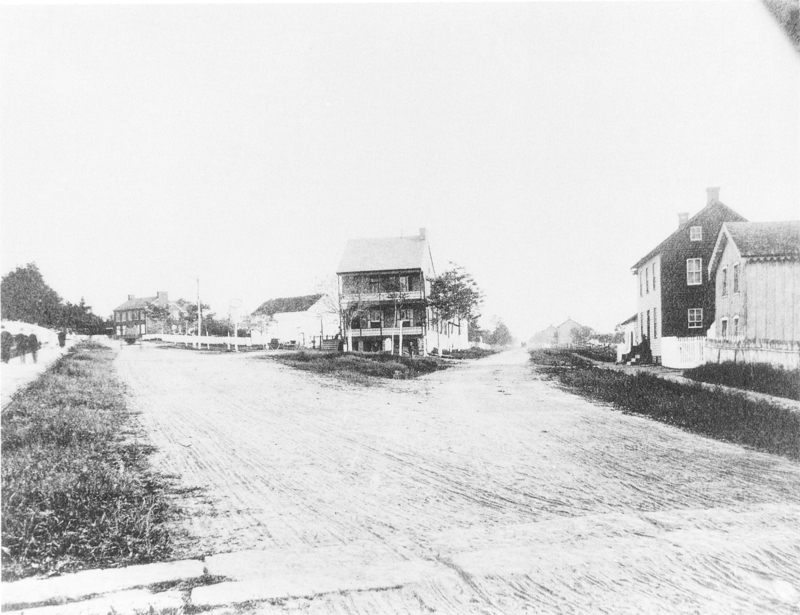 The Wagon Hotel is on the left in this period picture. This view was taken facing northwest circa July, 1865. 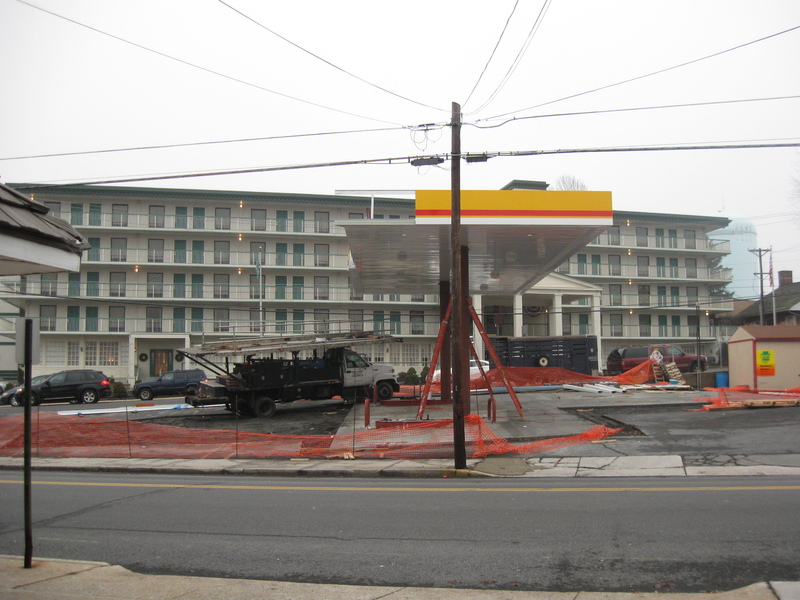 This picture shows the Gateway Mini Mart on the left. This picture was taken in the morning. It is not easy to pick out the overhang. This view was taken facing northwest at approximately 9:30 AM on Saturday, December 27, 2008. There isn’t that better? Now when you come off Cemetery Hill, driving towards downtown, your hands will probably turn the steering wheel into the gas pumps without your really knowing it. This view was taken facing northwest at approximately 4:00 PM on Saturday, December 27, 2008. Hopefully more development will be coming to the Cemetery Hill area soon. This view was taken facing west at approximately 4:00 PM on Saturday, December 27, 2008. As President Lincoln said at the top of the hill on November 19, 1863, “the world will little note nor long remember what we say here, but it can never forget what they did here.” Right? This view was taken facing southwest at approximately 4:00 PM on Saturday, December 27, 2008.